I thoroughly applaud the brilliant efforts of the athletes taking part in the Paralympics. To be selected to represent their country at a Paralympic level, given that they endure significant impairments on a daily basis anyway, is a tremendous achievement. As I sat and watched the opening ceremony for the Paralympics on Wednesday evening, I was delighted to see so many with disabilities involved in the artistic display preceding the parade of athletes from each country. As with the Olympics two weeks previously, everyone had a smile on their face and looked to be enjoying themselves. GB scooped her first medals of the games in cycling with Mark Colbourne winning a silver medal in a time trial and Sarah Storey clinching a gold in the individual pursuit. I imagine these two medals won will be the first in a raft of medals brought home by Team GB over the coming days. Importantly in the case of the Paralympics, we should not be focusing on the disabilities of the athletes involved but look to their significant abilities instead and these are plain for all to see. Such people are role models and others should seek to emulate their unwavering stamina and courage. I am in no doubt that these Paralympic games will not only be the best organised but the best attended too. After all the time and effort spent preparing for the Olympics, I thought they went seamlessly -and I am not just talking about the brilliant medal tally GB achieved. Every day during the last two weeks, the BBC provided coverage of the many and interesting sports which athletes from across the world can take part in and when I could, I very much enjoyed watching them. I was lucky enough to attend the Olympic Park to watch one of the first basketball games live between Great Britain and Russia and despite the wet weather on the way to the Olympic Park which failed to dampen the British spirit, it was an extremely enjoyable experience. The whole park looked wonderful and was adorned with beautiful borders of flowers, which I understand were all grown in Norfolk. The support for spectators getting to the event, whether in the form of clockwork transport, smiley volunteers eager to assist with direction or just general lavatory facilities at the venue, was extremely efficient too. By last Sunday’s closing ceremony I scarcely wanted the Olympic experience to end but needless to say the closing ceremony like the opening one was a fitting tribute to the Games successfully interspersed with typically British overtones. Thankfully however the Olympic experience is far from over because in under two weeks from now the Paralympics will commence and once more when I can, I will once more be able to indulge my fascination with sport. -For the Olympic events which have already taken place however, well done to all the incredible athletes who performed in them and well done to Lord Coe and his amazing team for making it happen. -For the Paralympics which have yet to start, good luck to all those taking part (especially the British ones) and let’s hope the medal tally is equally as high! I was delighted to be asked to be Patron of the Royston 2012 Olympics and Anniversary Celebration. This initiative is really putting Royston on the map. At a Westminster meeting to highlight Hertfordshire’s Olympic involvement Royston was specifically mentioned as the Hertfordshire Town which is best into the spirit of 2012. Of course, it is nothing new for Royston to show bags of community spirit – the Charity Pink Run on the Heath and all that fundraising for other good causes – but I do congratulate all involved in making 2012 such a focus for the Town. 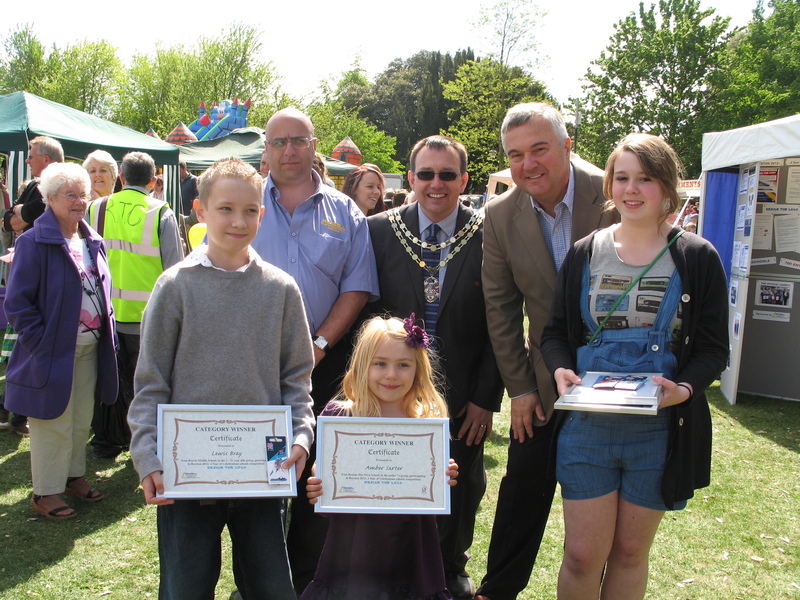 At the recent May Fayre I was pleased to see so many stalls and also to hand out the prizes for the Olympics Logo competition. Everyone did really well. Martin Beaver attended during his final days as one of our best ever Mayors and well done Heasells on sponsoring the awards!